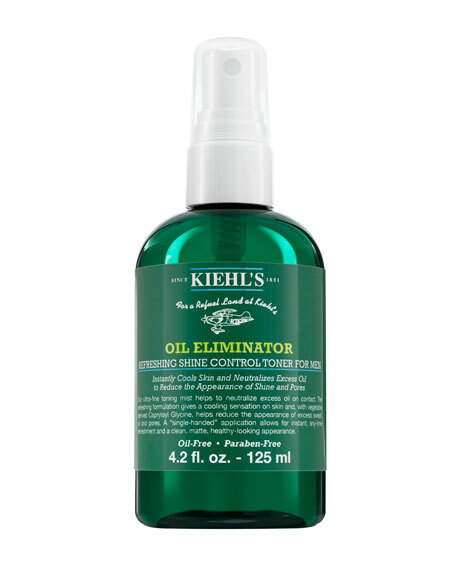 Kiehl's Since 1851Oil Eliminator Toner, 4.2 oz. This ultrafine toning mist helps to reduce excess oil on contact. The refreshing formulation gives a cooling sensation on skin and, with vegetable derived Capryloyl Glycine, helps reduce the appearance of excess sweat, oil and pores. A "single-handed" application allows for instant, anytime on-the go refreshment and a clean, matte, healthy-looking appearance. A "single handed" application allows for instant, anytime on-the go refreshment and a clean, matte, healthy-looking appearance.